Many birds fly into windows because they cannot see the glass. During migration, this can be particularly deadly because birds can hit windows with incredible force. 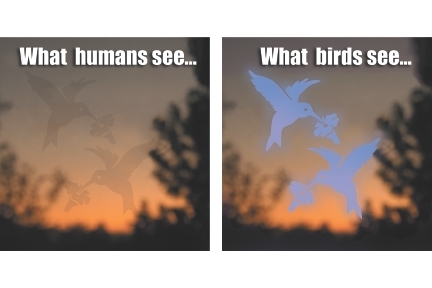 Some birds fly at the window because they see their reflection and think it's another bird invading their territory. 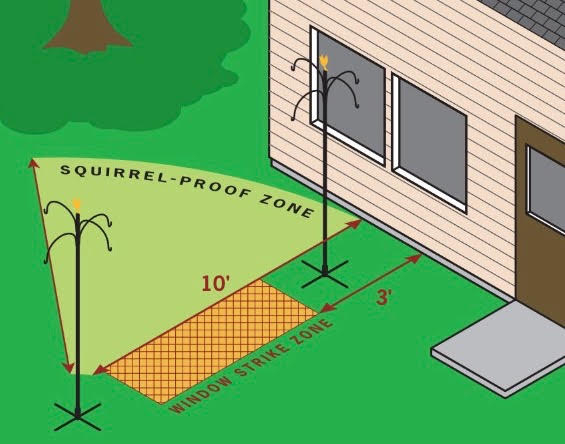 Locate feeders and birdbaths 30+ feet from your windows. If you want your feeders close to your windows, move them to within 1–3 feet of the window, or put up a window feeder. That way, if birds hit the window when "fleeing a predator," they will not be going fast enough to harm themselves. Place decals, including cut-outs of raptors, and leaded glass decorations in windows. Put vertical exterior tape strips 10 centimeters apart on windows. Cover windows with soap if appropriate. Plant shade trees outside windows to reduce the reflection. Home > Frequently Asked Questions > How Do I Prevent Birds Crashing Into My Windows?